The coastline around Khao Lak area doesn’t offer any reef diving, having mostly bare sandy bottoms without any reef, but there are a few really interesting wrecks just offshore and their location makes them perfect to dive at the end of a 4D/4N Similan Islands liveaboard trip. With MV Giamani this happens on Thursday when we do two dives in the morning before cruising back to Phuket. Since there are no reefs in the surroundings, the Khao Lak wrecks act as “artificial reef” providing good shelter and nursery conditions to a large number of fish species, which consequently attract a lot of predators such as trevally and rainbow runner, offering very good diving. The visibility is very variable and tide-dependant, ranging from 10-15 meters on an average day to 30+ meters on a good day. The Khao Lak Wrecks also host a large amount of macro life with different species of nudibranches, shrimps, ghost pipe fish and much more. MV Sea Chart, AKA The Teak Wreck, is definitely our favorite wreck dive on Thailand’s Andaman coast. 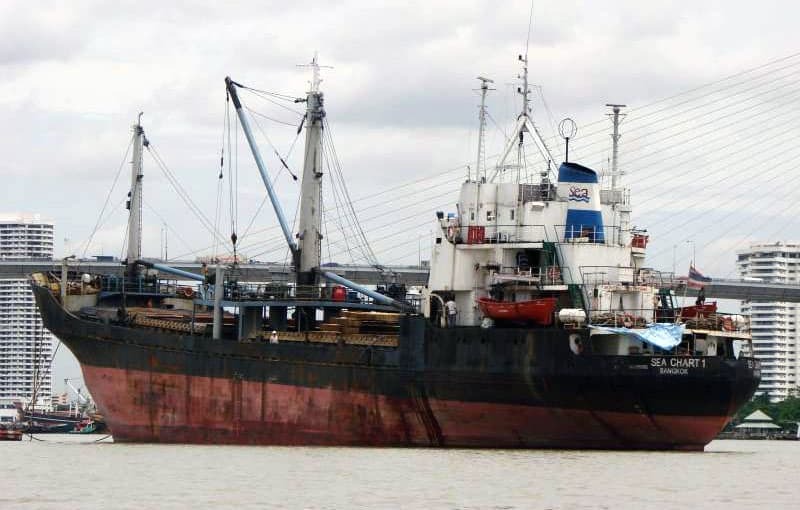 The 84 meters long ship was transporting huge logs of extremely valuable teak wood from Myanmar to Vietnam, when it sunk during a storm in August 2009 making a beautiful dive site for us divers! 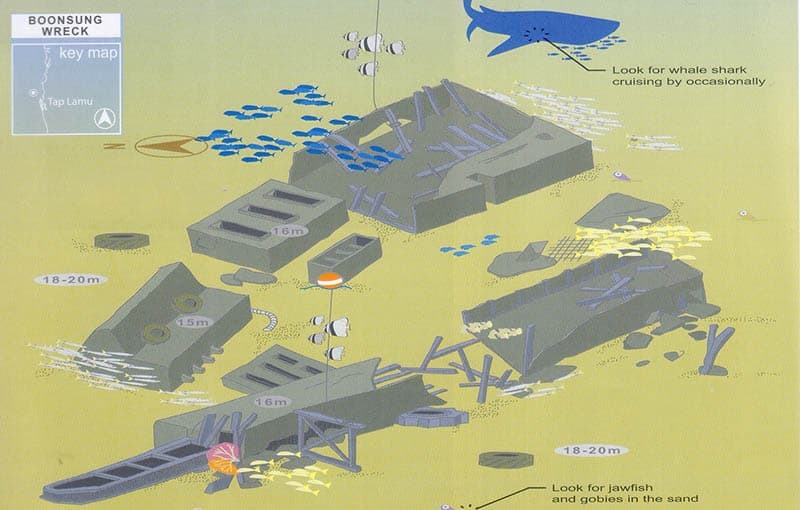 The wreck now lays on the starboard side on a 42-45 meters bottom. The shallowest part is at 24 meters, making it an advanced dive. Premchai Wreck, AKA “The Thai Muang”, used to be a dredger boat mining the seafloor in search of tin metal during the times of the great tin mining industry in the areas of Phuket and Phang Nga that died out in the 1980’s. Premchai was sunk on purpose by the Thai authority in 2001 to provide an artificial reef and a good dive site for us divers. 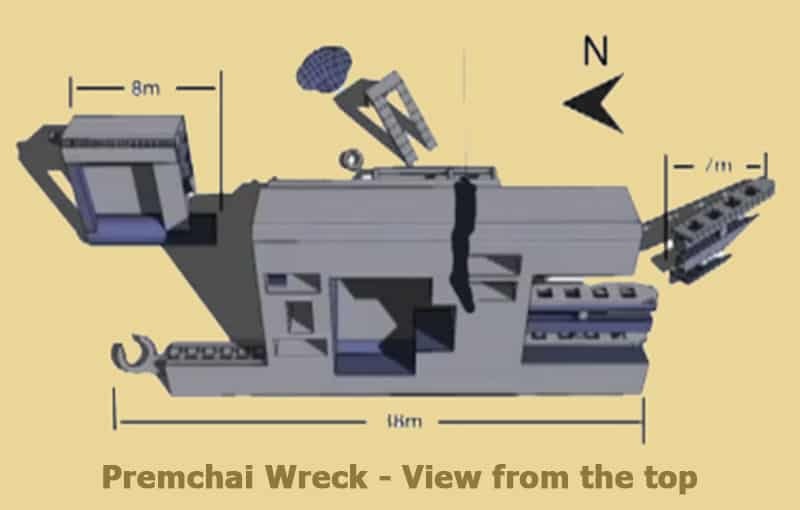 The Boonsoong Wreck use to be the same kind of dredger tin mining boat as Premchai (above) and many others that can be found laying on the seafloor off Phuket and Khaolak. Unlike the Premchai, the Boonsung sunk accidentally (or perhaps as insurance fraud) in 1985. The wreck is now very deteriorated due to the old age, but the amount of marine life is incredible making it a very interesting dive site nonetheless.